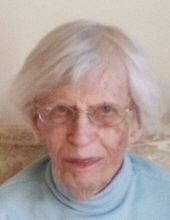 Elizabeth “Betty” Ann Johnson Davidson, age 96, died on December 3, 2018 at Point Manor in Stevens Point, WI. Betty was born June 8, 1922 to the late Walter Pyke Johnson and Mary Allen Green Johnson in Washington DC. She had two older brothers and one younger brother. She was the widow of William M. (Bill) Davidson, who preceded her in death in 1975. They were married on March 11, 1943 in El Paso, TX and moved to Stevens Point in 1946. They had two daughters, Katharine “Kay” (John) Johnson of Ashland, OR and Margaret (John) of Glenrock, Wyoming; in addition, she had six grandchildren and eleven great-grandchildren. Betty worked as a library technician at the UWSP library for 21 years. She was an active member of Frame Memorial Presbyterian Church, serving as an elder, a deacon, and on the committee writing the history of the church. She was a member of PEO and the Progress Club in Stevens Point. In her earlier years, she attended DePauw University in Greencastle, IN and graduated from UWSP with a major in history. She was also a member of the Kappa Alpha Theta Fraternity for Women. Survivors include her two daughters, six grandchildren and eleven great-grandchildren. She was preceded in death by her parents, her brothers, and her husband. A memorial service will be held at 11:00 a.m. Wednesday, December 12, 2018 at Frame Memorial Presbyterian Church. No visitation will precede the service. In lieu of flowers, memorial contributions may be made to Frame Memorial Presbyterian Church or to the American Cancer Society. The family wishes to thank the staff at Point Manor and Ministry Hospice for their kind and considerate care. To send flowers or a remembrance gift to the family of Elizabeth A. Davidson, please visit our Tribute Store. "Email Address" would like to share the life celebration of Elizabeth A. Davidson. Click on the "link" to go to share a favorite memory or leave a condolence message for the family.